The Crow and the Powderpuff | A Creative Makeup & Beauty Blog: Poison Absinthe Look using Sugarpill Cosmetics. 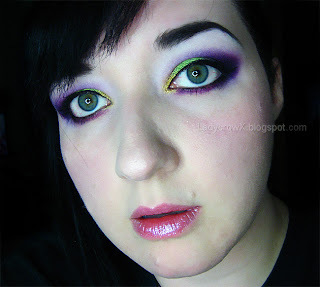 Poison Absinthe Look using Sugarpill Cosmetics. So for my birthday today someone had gotten me a new Sony camcorder camera, so I decided to do another tutorial video to test it out. I have to say it's fantastic for quality and I'm definitely loving it, the only downfall is that it kind of fades out colors a bit more. So I've still used my good old Cannon for taking the finished look pictures. Ah mah gawd, I love this! Poison Plum is beautiful and so is Absinthe. 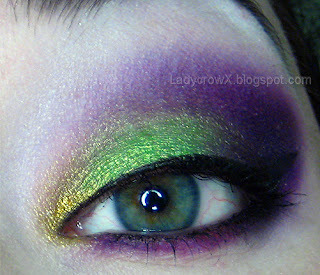 Great look, I love purple and green together! I like how you blended out Poison Plum. *****CLOSED****** End of Summer Giveaway!!! Nyx is on HauteLook 40% off! May the Fourth be with You Giveaway Winner!